MISSION, KS--(Marketwired - Oct 10, 2013) - (Family Features) Everyone wants to save money these days, and homeowners are no exception. To reduce the cost of monthly energy bills, many are taking on small, budget friendly, do-it-yourself projects that provide big savings down the road. With a few simple tips, you can easily make a home comfortable regardless of the season, while also greatly reducing utility costs. In fact, according to the Environmental Protection Agency, homeowners can typically save up to 20 percent on heating and cooling costs, or up to 10 percent of total energy costs, just by properly air sealing their homes and adding insulation. In most homes, about 20 percent of the air moving through the duct system is lost because of poorly connected ducts, holes and leaks. Signs include rooms that are tough to cool or heat; ducts are located in an unfinished basement, garage or crawl area; or you have high-energy bills. The use of a sealant, such as the DAP 3.0 Window, Door, Trim & Side High Performance Sealant, is a cost-effective solution for fixing leaky ducts in your home. Be sure to give your roof a thorough inspection. Check for loose shingles that can lead to water damage and rot. 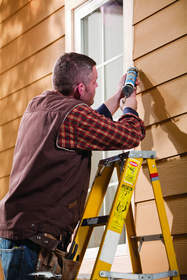 Also, be sure to seal any gaps around gables, flashing and chimneys. Check to see that all exterior wall penetrations, such as lights, doorbells, hose spigots and dryer vents, are properly sealed to ensure maximum energy efficiency. Gaps around house fans, attic access doors, exhaust fans and light fixtures send warm air right up into your cold attic, so make sure these areas are properly sealed. If you have a basement, using an elastomeric sealant or foam sealant around the rim joist is one of the best ways to weather seal your home. A foam sealant, such as the DAPtex Plus Multi-Purpose Foam Sealant, will fill and seal any large cracks, gaps or voids. For more information, visit www.dap.com. This can be checked by going in the basement and looking up at where the bathtub is on the floor above. If you can see the bottom of the tub, you're paying good money just to condition the air on the bottom of your bathtub. Seal it up with foamboard and a recommended foamboard sealant. Investing a little time and money on properly sealing your home now can mean a big return on your heating and cooling bills down the line. The newly-formulated DAP® 3.0™ products help do-it-yourselfers weatherize and make home improvements faster.